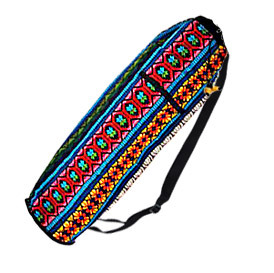 Take a walk on the wild side with our large handwoven Mayan Yoga Mat Bag. We’re proud of the craftsmanship of this hand-woven mat bag, but it’s the design and convenience you’ll fall in love with. The Mayan yoga mat bag is a generous 30'' long and 11.5'' wide, which means it will fit any sized yoga mat with ample room for extra yoga gear and accessories. Made from 100% woven cotton in four pattern choices to choose from, this mat bag features a large zippered exterior pocket, drawstring closure, and a strong, reinforced adjustable sling strap. The Mayan mat bag is fully lined and padded on the inside. The mat bag is just right. Fits my mat, blanket and strap and I love the front pocket.